The GMC Denali is an entry level road bike which is here to sizzle the roads with its lightening fast pace and slick looks. This bike comes equipped with a strong but light aluminium frame and GMC 7000 Series fork which provide just the right level of stiffness. The ride quality offered by this bike is extremely smooth and the ride position offered is extremely comfortable. The Shimano equipped drive train of this bike ensures top-notch performance coupled with speed and agility. The 21-speed gear range of this bike is sufficient for handling any type of terrain with ease and grace. Promax 501A series alloy calliper brakes offer ample braking force and provide precision braking with high stability and control. Vitesse alloy black rims come with the promise of durability while the Cionlli black saddle offers a comfortable ride experience. This bike offers to you a complete package of speed, performance and durability at a staggeringly low price and it delivers the ultimate value for your money. The GMC Denali Road Bike comes with a 7005 Aluminium Frame (Straight Gauge); GMC 7000 Series Steel Fork; KMC Z-51 Chain; Pro-wheel Alloy 335P6 170 millimetre Crankset (28x38x48); Shimano FD TZ 31 Index Front Derailleur; Shimano RD TZ30GS Rear Derailleur(7 speed); Shimano Revo SIS L2/R7 Shifters; Kenda Black Tires (7x28C, Grey band); Aluminium Black Stem (100 millimetre , 0o); Maesband Handlebar; Cionlli Black Saddle; HL Aluminium Seatpost with Micro-adjust feature (27.2 x 300 millimetre); VP-990S Plastic Body with Steel Cage . GMC Denali is an entry level road bike by GMC. Light, fast and agile, this bike delivers a power-packed performance and has all it takes to be a high-performance road bike. This bike comes with a steel fork and an aluminium frame. Shimano components have been used for derailleurs as well as shifters and they live up to their usual reputation; shifting is quite fast and seamless while the 21-speed gear range offers ample options to the riders to pick and choose from. This bike does not ship assembled and the steering columns, saddle, the pedals, the front tire and the reflector needs to be put together. The brake and the derailleurs will need some tune up. If you have assembled a bike before, this should be sgtraight forward. However, if you face any difficulty or have not done something like this before, it is best to pay a visit to your local bike shop with the bike. Although the bike is a bit on the heavier side for a racing bicycle, it is perfect for commuting or fitness riding. Overall, the bike performs well on all fronts. The ride quality is quite smooth which makes it a really good commuter bicycle as well. 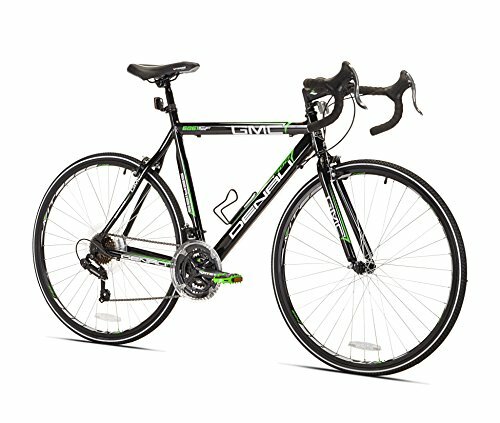 The price of this bike is extremely reasonable and the components used in this bike coupled with the performance delivered by the bike make it an absolute gem of a road bike.